I recently made this pasta salad for a party, and it was a huge hit! 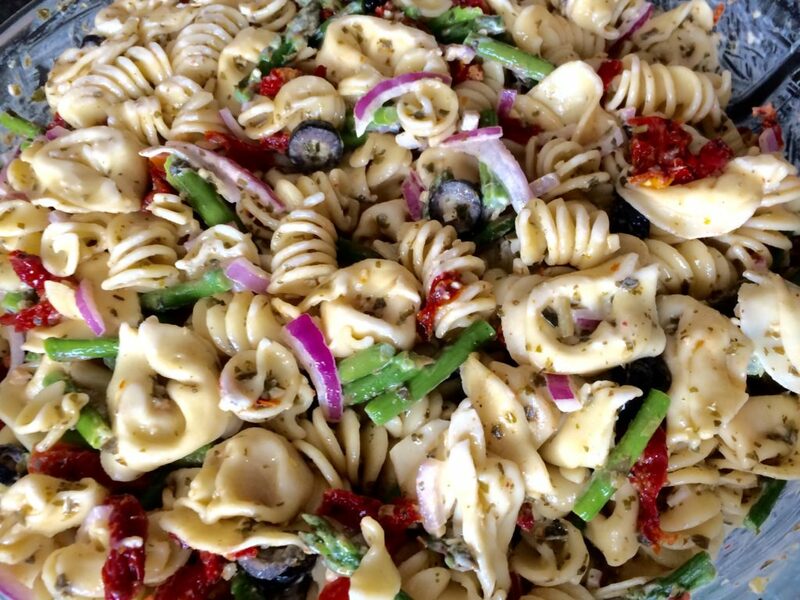 I’m not always a big fan of pasta salads because I think they often lack flavor, so I wanted to load this one with flavor — basil pesto, sun-dried tomato, black olives, red onion, asparagus, cheese tortellini — and it didn’t disappoint. If you’re making this for a crowd and want to cut costs, skip the tortellini and use all rotini (or your pasta of choice). Cook pastas according to package directions. Drain and cool. Cut asparagus into 1-inch pieces, and steam until tender but crisp. Drain and immediately place into an ice bath to cool and keep color. Drain again when cool. In a small bowl, whisk together the mayo and pesto. In a large bowl, combine the pastas, asparagus, sun-dried tomatoes, onion, and black olives. Add the pesto mayo, and toss gently to coat evenly. If you’re looking for a way to spruce up salads, look no further! 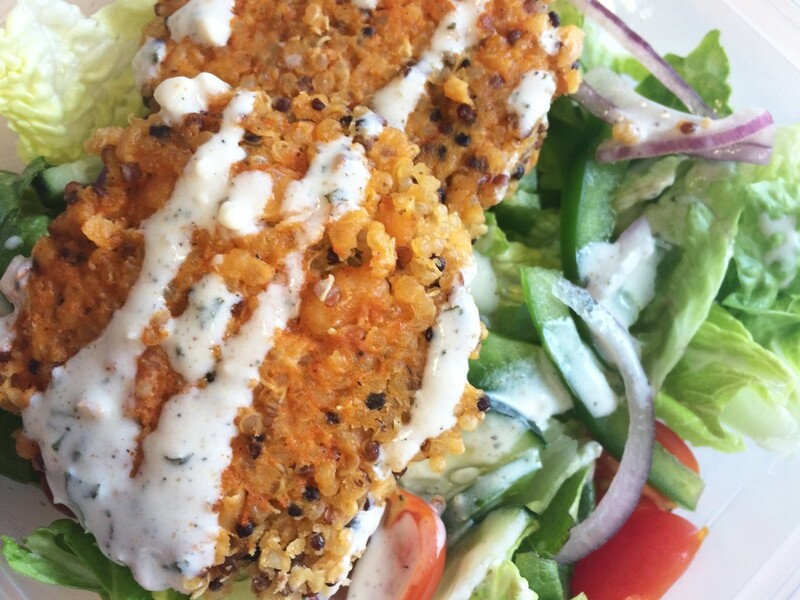 These buffalo quinoa-white bean patties actually make me look forward to my lunchtime salad. Plus, the recipe is easy, makes a lot, and is healthy. I like to make a batch on the weekend, and then store them in an airtight container in the refrigerator for a convenient addition to my workday lunch. Combine the buffalo sauce ingredients in a small bowl and whisk together. In a large bowl, add the mashed beans, cooked quinoa, Panko bread crumbs, egg, salt and pepper, 1/4 cup of the buffalo sauce. Stir to combine. On a greased baking sheet, add rounded tablespoons of the mixture and flatten gently with your hands. Lightly spray the tops of the patties with olive oil cooking spray. Bake for 8 minutes. Carefully flip each patty over, and bake for an addition 8 minutes, until golden brown. Drizzle or brush the remaining buffalo sauce over the patties. Cool, and then store in an airtight container in the refrigerator. Serve on a salad cold or heat for about 1 minute in the microwave. If you make any of my recipes, you need to make this one. Really. It’s so good. I could make it every single week. Even my husband said this is the only way he wants me to make mac and cheese now. The addition of pureed butternut squash not only gives this dish a nutritional boost, it adds just a hint of sweetness and even more creaminess. And the smoked paprika pares perfectly with the squash and rich cheese flavors. My stomach is growling from writing this. Time for leftovers! Bring a medium pot of salted water to a boil. Add the pasta and cook according to box direction. Drain and set aside. Heat a large saucepan over medium heat. Add the butter. When melted, whisk in the flour and cook for a minute until golden. Add the milk, whisking constantly until thickened, about 5 minutes. Stir in the butternut squash. Remove from heat and stir in the cheese. Add in the paprika, cayenne pepper, and salt and pepper. Stir in the cooked pasta until evenly coated with sauce. Pour into a greased 11/2 quart baking dish. 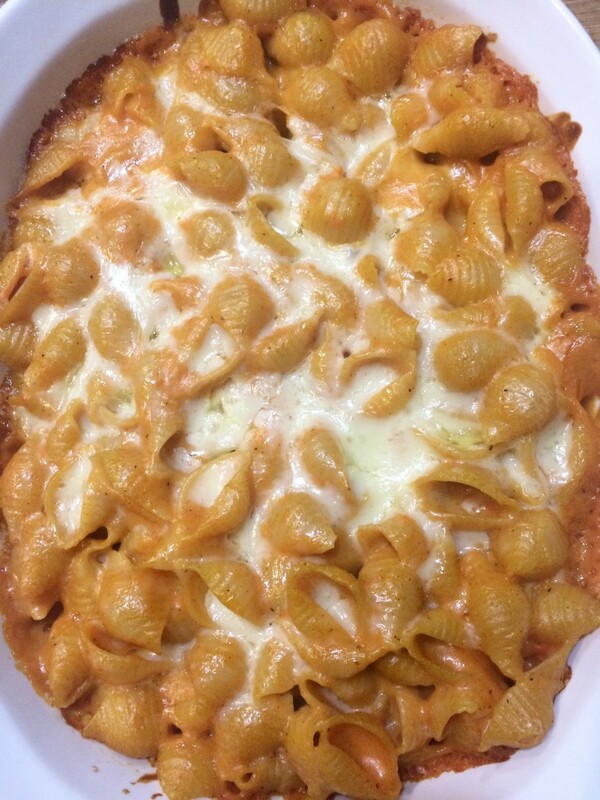 Top with remaining 1/2 cup of cheese. Cover and bake for 30 minutes, uncovering for the last 10 minutes. *I always have butternut squash puree in my freezer. (It's great for cookies, cakes, pumpkin whoopie pies, etc.) To make, cut the ends off a butternut squash. Carefully cut in half lengthwise, and scrape out the seeds. Place cut-side up on a baking sheet. Sprinkle with water, and then cover with foil. Roast at 375 degrees for about an hour, until soft. Let cool and then scrape squash from the peel into a food processor and process until smooth. Freeze in half cups and 1 cup amounts in sealable bags or freezer-safe containers.